It might be a while until I finish the two big quilts I started at the Retreat, instead I'll reveal one of the mini quilts I started there and finished at home. In some ways I wish I had started the easier quilt first. That way I could have easily had a large quilt top finished and felt like I accomplished more than I did. But I didn't. Just one more tip for next year! After getting home and settling in, I pulled out my Mr. Fox block and assessed the situation. He couldn't be much cuter...or could he?! I came home with a small, but adorable 6" X 6" unfinished block. I could have stopped there, or I could see if I could up the ante with it. I'm upping the ante! I've gotta give it a try. Borders are one way to take it up a notch. There are a million and one options, which made me actually have to think before I act! 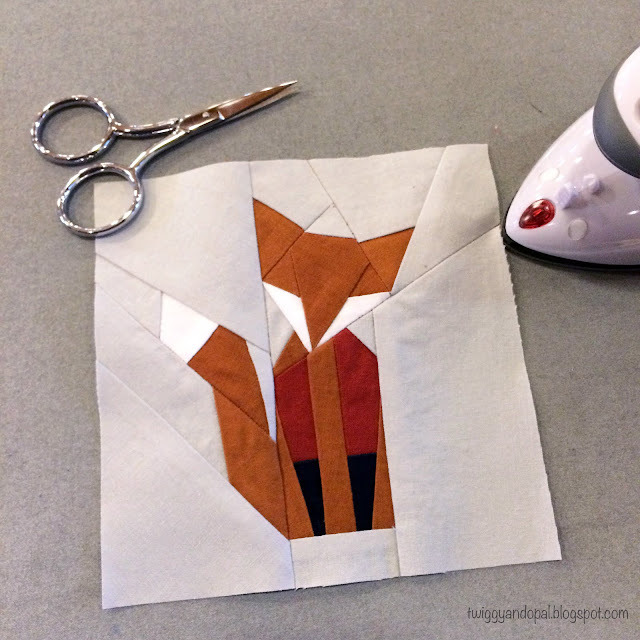 I was sure I didn't want to make a cute border, more of a classy Foxy Fox kind of border. And I wanted to stay with the colors I've already used. I added a 1/2" border using the leg color and then another 1/2" border with white. It still needed something more and so I threw in the 1/4" border. Liking the direction this was going, I decided that the last round would be a 1 1/2" in grey. In some ways it looked anemic to me. You know, lacking color...or lacking something. I contemplated, scrutinized and stared until I had the perfect idea! Light bulb moment! Maybe there were two light bulb moments! The first, by adding the black binding it really pulled it all together. 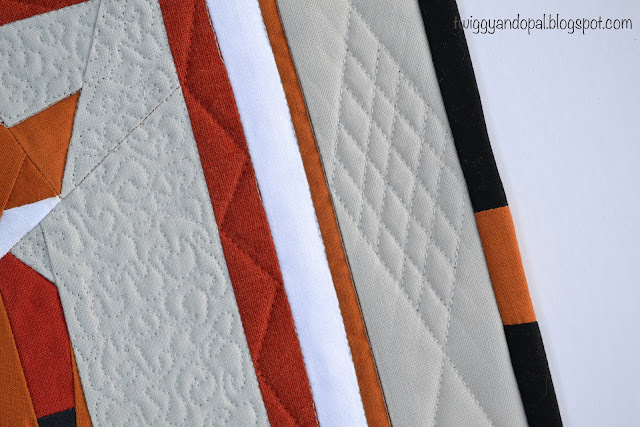 In my opinion, it took the ordinary to a sophisticated and classy quilt. 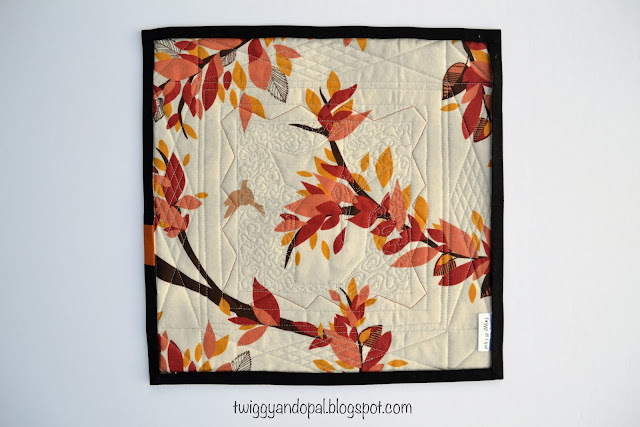 It might be the first time I've ever used sophisticated to describe one of my quilts! The second light bulb moment came while I was deciding how to keep the classy vibe with my quilting. I did some tiny stippling around the fox, but didn't do anything other than outlining to the fox. The real classy moment came when I quilted a nice geometric diamond around the last border. Almost argyle-ish! I never would have thought going simple would have been so effective! It was a triumphant moment for me! Lets not forget about the little pieced binding section. Seriously...I did that only because my one strip of black wasn't enough! I figured adding a piece would be perfect...maybe you might think I planned it all along! 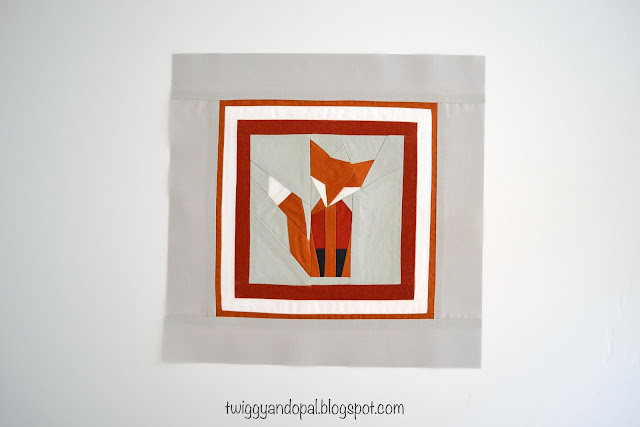 Making mini quilts is also a time to use scraps or undesirable fabrics as the backing. When I saw this fabric in my stash...it was like angels singing! Pure perfection!!! The colors worked, and I had a piece that was just wide enough! Mr. Fox will be heading to New York for his final destination. I've decided I will make this again...because now I want one for myself!! You can have one too! Mr. Fox is a free pattern by Stars & Sunshine. Click here: Mr. Fox for the link to the pattern. 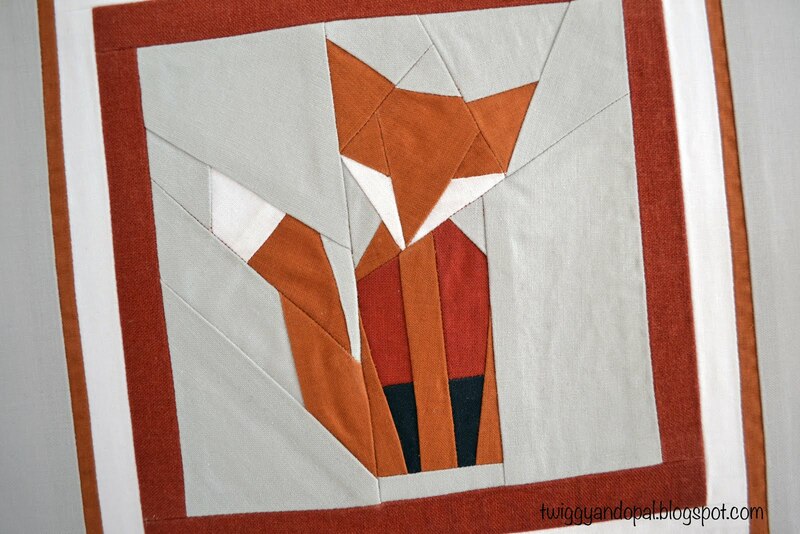 I'm thinking I might also like to make a small quilt with cute animal blocks. Like Mr. Fox, 'lil Hedgehog, Mr. Squeak (watch for the post on him! )....if you have any little animals, let me know! I was trying to think of a comment that was classy and dramatic like your little quilt but I just couldn't - your quilt is just adorable! I can see a few of these in my future - some for grandchildren, and one for me! Thank you for trying to keep it classy!! LOL! I’m in love with this little fox and seriously plan on making me one! I hope you get a chance to make it too! Love how you framed this one with both the borders and the quilting. It really made it come to life. 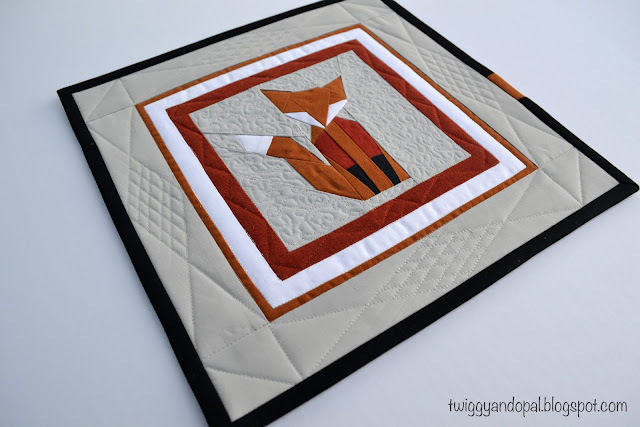 Really love the quilting on this one! Thanks for sharing your thought process, step by step! Fun to see how you got there! Great job! I had so much fun making this and then adding the borders to elevate the design! Goodness! That is soooo adorable! Definitely making one. Love the quilting you went with, perfect. I highly recommend making it! For me it was too cute to resist and I’m glad I finally had the chance to make it! Your quilt is the sine qua non, indubitably! I always think, when I have a growing WIPS list, that its best to start with the project that is closest to a finish! I love Mr Fox! And your quilting was inspirational! Thanks for the link to the pattern! I'd love to make one of these, and even copy your borders! I agree on your WIP philosophy! Adding a couple small projects in between the tedious and time consuming Churn Dash blocks helped so much! I enjoyed making this fox from beginning to end! 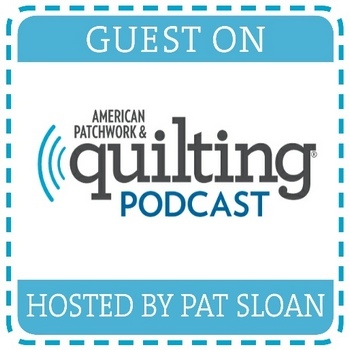 Even the quilting was fun…for me that’s saying something! I hope you make one…and please do copy my borders!! Thank you so much for the cute pattern. What a beautiful fox. I specially love the way you quilted the border. The back also looks amazing. 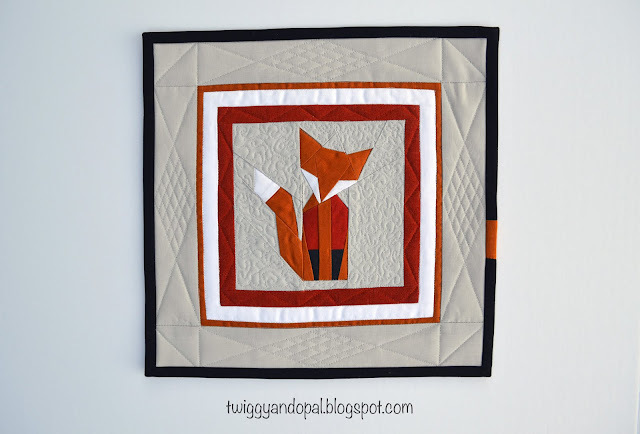 The tiny little orange in the binding adds so much to the whimsy of the quilt. A wonderful finish, Jayne! Quilting a project isn’t usually fun for me, but this one I thoroughly enjoyed! Cute mini, I love everything on it, pattern, quilting design, binding! That little guy is so wonderful, Jayne! I just recently remembered how much I like paper-piecing, but I've never tried an animal. That will be something I'll have to do! I love what you did with him! Adorable! You always do such a great job tying a project all together. Thanks for sharing this clever guy with Oh Scrap and for being so inspiring! You knocked it out of the park with the borders and the quilting. Wow. I always think that framing a quilt is a must ..bit like framing a picture. Love Mr Fox. Oh yes that was the right touch to finishing off cute Mr. Fox. I noticed your little bit of orange in the binding way before you mentioned it. It's a Jayne thing-like your signature;) I think it really added just the right touch. Funny you mentioned sophisticated, just lately a customer told me she appreciated my sophisticated runner, I never think of my stuff as sophisticated! This is very cute Jayne and thanks for the link to the pattern! Mr. Fox turned out so delightful! I love the playful quilting in the borders, it adds so much to the finished composition.